Hey hey new followers! Nice to see all of you here. 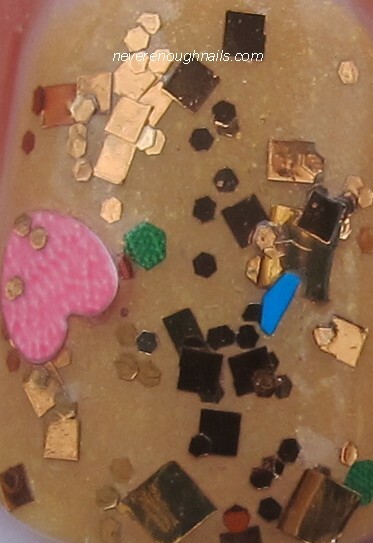 I know you came for the Nicole by OPI Holiday collection giveaway, but I hope you end up staying for the swatches and reviews! 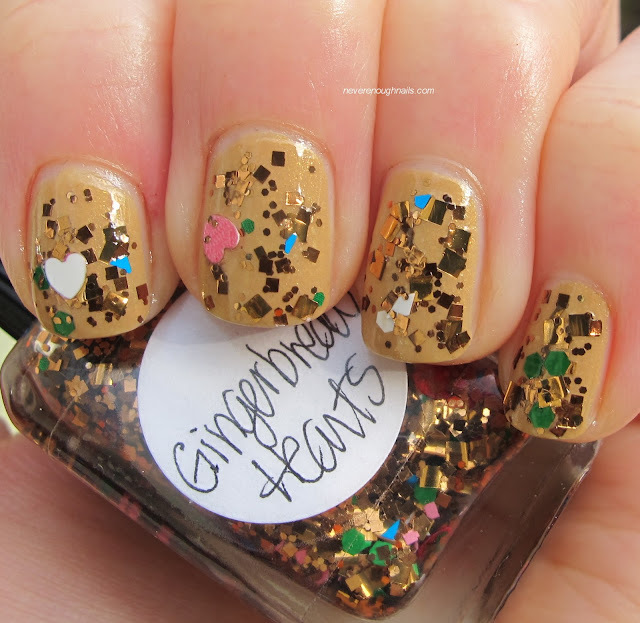 Today's NOTD is Lynnderella Gingerbread Hearts over China Glaze Classic Camel. 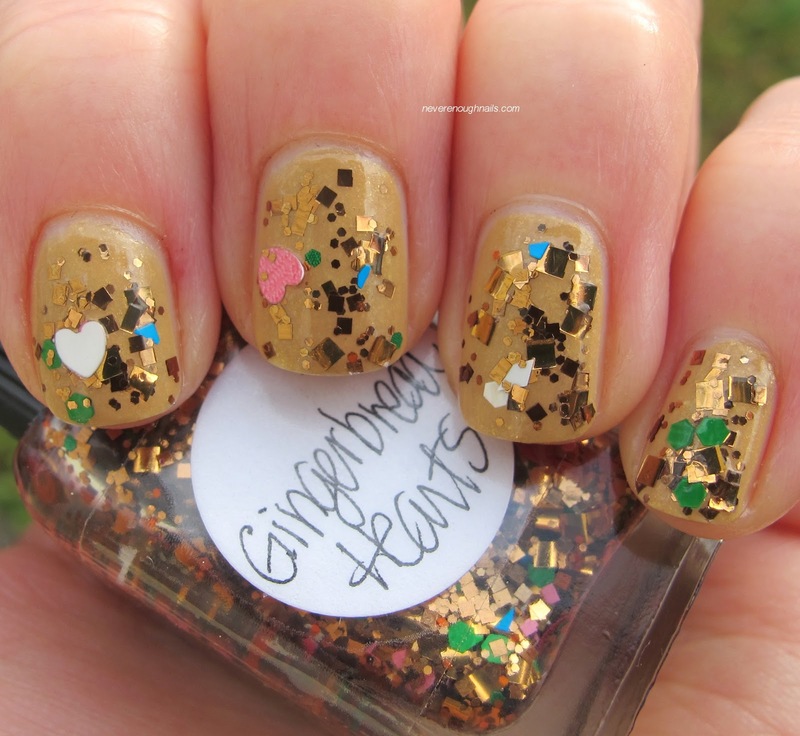 Gingerbread Hearts is from the new Season's Glitterings collection and a portion of the proceeds of the polish goes to Gingerbread House in Shreveport, LA. 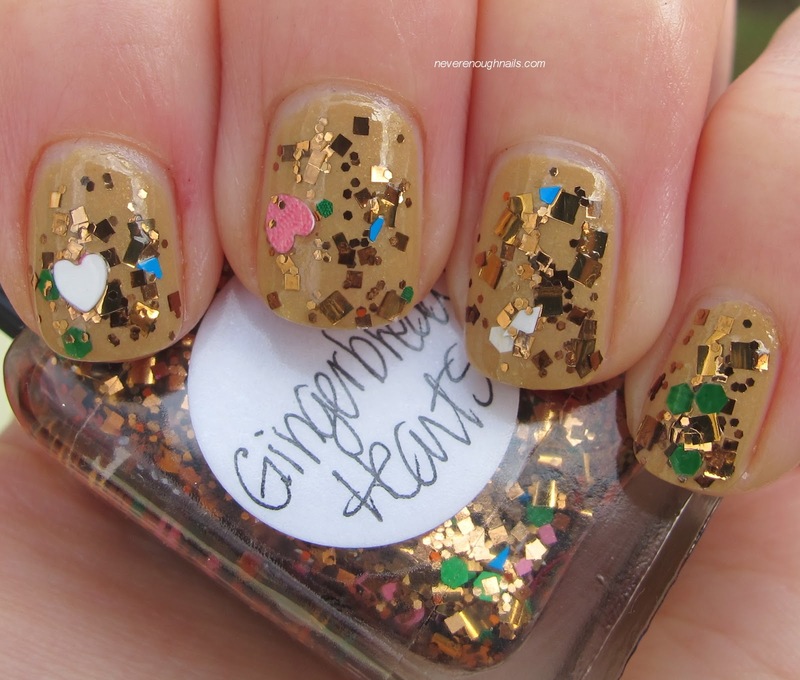 Gingerbread Hearts is a nice mix of different sized ginger colored glitter in a clear base, with a smattering of matte red, white, blue, pink and green glitter for pizazz. Of course, Gingerbread Hearts also has heart glitter!! I got two pink ones and a white one in this mani (one pink one is on my thumb nail). This polish definitely required a little patience to apply. It needed to be dabbed, not wiped. The hearts did not really want to come out and play. I was just starting to think that I would not get any hearts in this mani when I suddenly found three. I just kept dipping the brush in and wiping it off until it finally came out with a heart on it! I think the end result is worth a bit of effort, but if you like really easy application, maybe skip this one. I saw this over a gold foil just this morning and wish I had done that instead!! I'll have to do that soon and show you, because it looked amazing! Lynnderella Gingerbread Hearts is available on her eBay store. This is such a cute color and idea! Hi Heather! It is really cute :) It reminds me of the holidays, but is perfect for when I don't feel like wearing red and green! 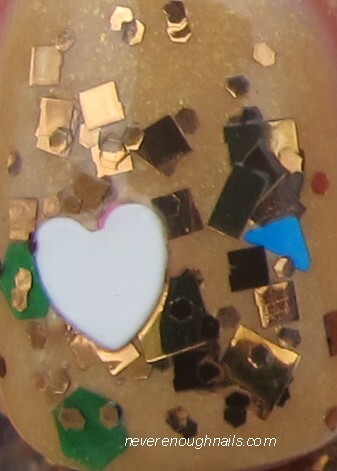 I love the China Glaze color - that's so pretty! I will have to get that sometime :) Great mani! !